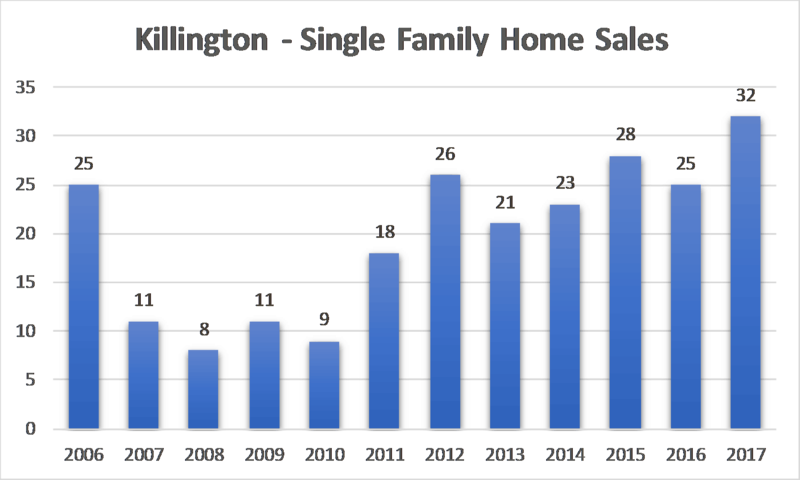 KILLINGTON—With 151 total property sales, “2017 was a record-breaking year for real estate sales in Killington, surpassing the number of sales at the peak of the market in 2006,” reported Kyle Kershner, broker/owner of Killington Pico Realty. The year 2006 saw 139 total sales, including all types of properties from land to condos. Currently, there is an inventory of 36 homes for sale versus over 50 a year ago. “Median sales prices for homes in 2017 were up 9 percent over 2016. For several years we’ve been seeing more sales year over year, but it hadn’t turned into appreciation – median sales prices remained flat but 2017 was the first time we saw a jump,” Kershner noted. “Inventory had been staying high with people listing as fast as we were selling, but now with inventory coming down we may see more appreciation,” he added. “In Dec. 2016 there was a 23 months’ supply of single-family home inventory and in one year the supply has dropped by a half,” he said. 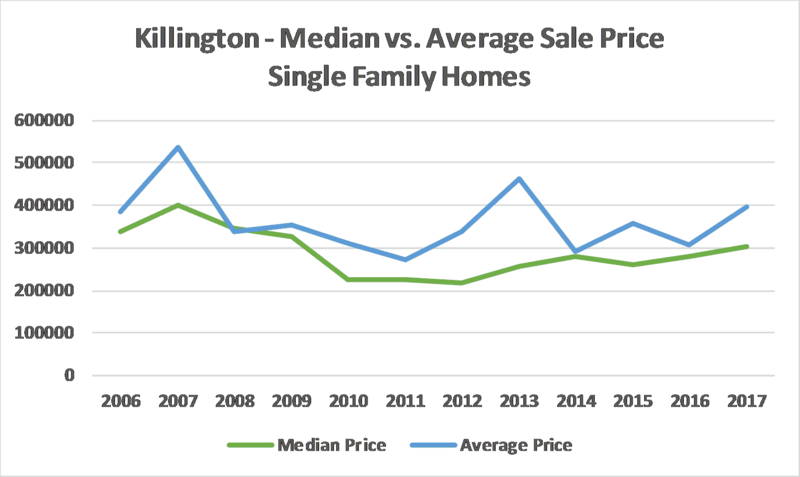 Condominium sales have also been going up year over year, but prices have remained reasonable compared to some other ski markets, and the good values people were seeing in Killington may help explain the sales increases, Kershner noted. Currently, condo inventory is also down and 2018 sales through March 29 show 14 sales as compared to 15 sales for same time in 2017. However, the median price has risen to $128,250 in 2018 as opposed to $110,000 a year ago. In the past 12 months there have been 84 condo sales, and currently there is an eight-month supply of condos on the market, with 56 available. “We’re no longer in a buyer’s market, but we’re not quite into a seller’s market. We are transitioning out of the buyer’s market and into a more balanced market,” Kershner said. Other trends are positive, too, he noted. By way of example, he said that at the November 2017 annual meeting of unit owners (at the Killington Grand Hotel), the president of the Killington Grand Hotel & Crown Club Owner’s Association stated that gross rental revenue has risen 47 percent since 2009 and 9 percent since 2016. Room nights are also growing at the Grand Resort: 28,482 in 2013 and 38,299 expected in 2018, making it the second busiest hotel in Vermont, behind Stoweflake in Stowe. Kershner added that “two years ago hotel studio quarter shares were going for $13,000 to $15,000; now the lowest listing is $19,600.” He attributes the increases to more summer activities, the new Adventure Center, and an increase in weddings at the hotel. “Winter is the second-best busiest time of year with mid-summer into fall typically seeing the most serious buyers and consequently busiest with the most transactions occurring September through November,” Kershner noted.